The prehistoric island of Jindo is one of the 14 states of Korea and is connected to the mainland by a twin bridge which was the world’s longest and narrowest bridge at the time of its construction. The island had many names in the past and served as a refuge to rebellion forces during the Mongol invasions. It is also famous for a very specific breed of dog called “Korean Jindo” which is known for its fierce loyalty and hunting abilities. This dog has also been considered a national, cultural legacy since 1936. The uniqueness of Jindo’s location and a combination of various factors results in a one-of-a-kind natural phenomenon known as the “Jindo Sea-Parting,” and here is more about it. Jindo Island, located on the southwest corner of the Korean peninsula, is well known for the Jindo Sea-Parting Festival. This is held when the East China Sea has such low tides that it exposes a 2.9-kilometer, narrow, land passageway to a small, nearby island. Jindo Island is the third largest island in South Korea. It is located in South Jeolla Province and is separated from the mainland by the Myeongnyang Strait. Along with a group of other, smaller islands, including Modo Island, it forms the area known as Jindo County. Every year in the spring or summer, a narrow land passageway about 2.9 kilometers (1.8 miles) long and up to 40 meters wide opens up for about an hour on four consecutive days between Jindo Island and Modo Island. The sea-parting was made famous worldwide when, in 1975, Pierre Landy, former French Ambassador to South Korea, called it the “Korean version of Moses’ miracle” in a French newspaper when comparing it with the Biblical parting of the Red Sea. According to legend, a woman prayed to god every day when she was left behind after the villagers fled to Modo Island because of tiger attacks. One day, god came in her dream and said that there would be a rainbow road the next day for her to meet her family. According to Kevan Moffett, an assistant geoscience professor at the University of Texas, the sea parting has been happening over a long enough time to give birth to legends and traditions. As the story goes, tigers were once abundant on Jindo Island, and they began attacking local villages. A woman named Bbyong was accidentally left behind when her family fled. She prayed every day to Yongwang, the god of the ocean until one night he came in her dream and told her that a rainbow would appear in the sea for her to cross. When she went to the sea the next day, it parted revealing a rainbow road and her family crossed the sea to meet her. The parting of the sea is believed to be the result of phenomena known as the tidal harmonics which include varying factors that sometimes are in phase creating extremely high or low tides. Earth’s rotation cycle or the movements of the Earth and the moon that result in varying distances between them are some examples of tidal harmonics because their occurrences are periodic. 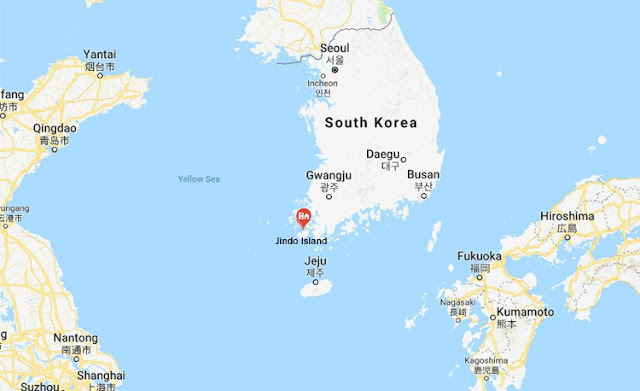 According to Moffett, a combination of these factors, along with the shapes and positions of the islands and of the Myeongnyang Strait to the east of Jindo, result in extremely low tides and are the reason for the annual parting of the Jindo Sea. 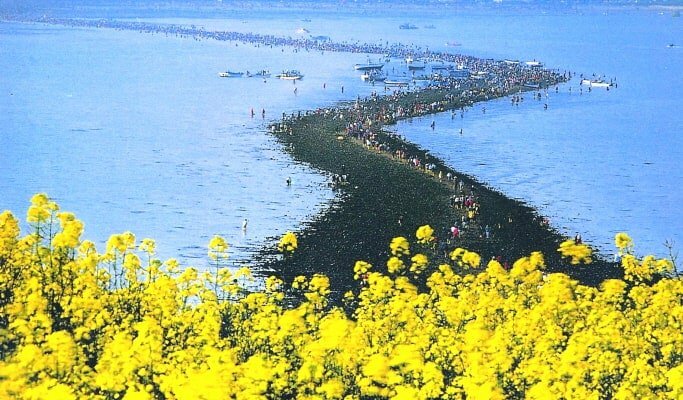 The Jindo Sea-Parting Festival attracts hundreds of thousands of tourists to enjoy the festival and folk rituals. It is also a time when the locals dig for clams and seaweed. 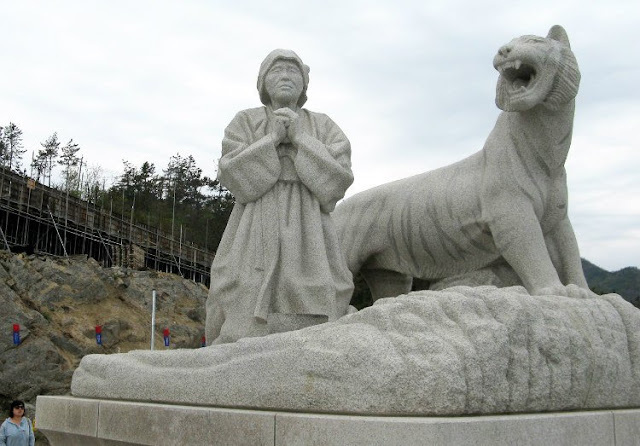 The festival is also held to commemorate Bbyong whose statue is present on the Jindo shore. Several people also take the yearly pilgrimage to Modo island and pay homage to the statue of her family there. Ganggangsuwollae (a traditional Korean dance), manga (burial songs), ssitkim-gut (a ritual for the dead souls), deul norae (traditional farmer songs), a Jindo dog show, fireworks, and various other events are held. Visitors also dig for clams, crabs, abalone, seaweed, and other seafood which they can have cooked to order at any of the tent restaurants along the shore.